Speech-Language Therapy is recommended for children who experience difficulty understanding language, processing verbal information, expressing themselves, articulating speech sounds, with phonemic awareness, speaking fluently, voicing correctly, and/or participating in conversations. The speech-language pathologist's goal is to assist children in learning new skills and becoming independent and functional communicators through a variety of structured and non-structured activities. My 18 month old daughter is not saying single words yet. She does not seem interested in communicating with our family. My son’s classroom teacher mentioned concerns about his ability to understand and follow directions similar to his peers. He often needs to hear multiple repetitions of the direction. I have difficulty understanding what my 4 year old is saying. He is beginning to get frustrated when I do not understand. My 6 year old daughter is not able to verbally speak. I would like to explore other options for her to communicate, such as sign language or a communication device. My daughter is constantly drooling and does not seem to know how to chew her food properly. I am worried that she does not have very good oral motor skills. My 10 year old son does not know how to interact with his peers at school. He is having difficulty making and keeping friends because of this. My 5 year old son is starting to stutter and I am worried because his uncle is a person who stutters. My child’s voice constantly sounds hoarse and she has difficulty using a louder voice volume to be understood by others. My son does not have a diagnosis, but seems to be having difficulty meeting his developmental milestones. 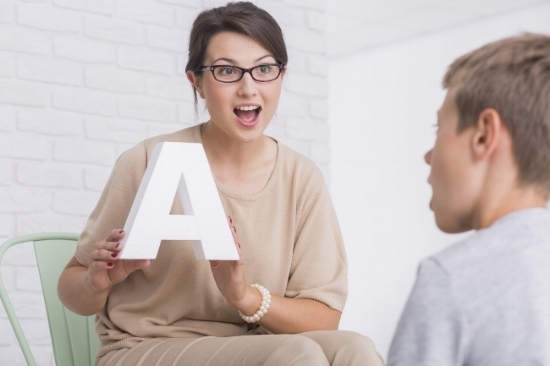 Following a comprehensive speech/language evaluation, completed at Creating Pathways Pediatric Therapy, a certified speech-language pathologist will develop a treatment plan individualized for the child. Typically, Creating Pathways speech-language pathologists use a combination of child directed and therapist directed approaches throughout a therapy session. Child directed therapy allows the child to take the lead. This type of therapy is play based and is motivating, interesting, helps to generalize skills, and teaches the skill that matches the activity. While playing, a variety of toys, games, flashcards, pictures, books, objects, or electronics are used to address specific areas of need. Older children often can follow a more therapist directed approach because they have the ability to attend longer and understand the importance of practice. This approach allows for more drill practice and less games/toys for motivation. Therapist directed approach is used as much as possible so that the most progress can be made. Communication is an essential component of learning and development that begins in infancy and continues throughout adulthood. A baby’s first cries are their way of communicating basic needs (e.g., hunger, pain, boredom, etc...). These first cries quickly develop into coos and squeals to communicate happiness and joy. A typically developing child then learns the importance of using words, gestures, body language, and facial expressions as means to express wants, needs, and feelings. All children need to communicate in some form. Children who are experiencing difficulty with their communication abilities may not be able to successfully express themselves, gain independence, have good self- esteem, benefit fully in educational learning and development, and/or build healthy relationships.